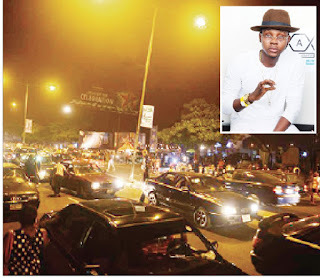 Fun seekers in the early hours of Monday scampered to safety after armed robbers stormed the Calabar Christmas Village while a popular Nigerian musician, Daniel Anidugbe, aka Kiss Daniel, was performing. It was learnt on Monday that the robbers, whose numbers could not be ascertained, stormed the village at about 1am and shot repeatedly into the air while dispossessing people of their valuables. An injured shop owner in the village, Glory Andem, told PUNCH Metro that the presence of robbers became obvious when some spectators started throwing bottles at the musician. “They were throwing bottles and other things at him. Before we knew it, they brought out guns and started shooting. Some security men immediately rushed to the singer. But even with the security, the robbers rushed at him and removed his clothes and collected things from him. “They would have killed that guy. To be honest, I don’t know how he managed to escape. You know there are several thousands of people in the Christmas village usually and the situation led to a serious pandemonium. “They broke up everything in my shop. They took all my money. They robbed a lot of shops. Our chairs were broken. Everybody was running at the same time. It was a terrible experience. But the state Commissioner of Police, Mr. Jimoh Ozi-Obeh, said it was not a robbery attack, but a misunderstanding between the organisers. He said the original plan was that Kiss Daniel and other musicians would perform at the U.J. Esuene Stadium in Calabar, but the venue was changed to the Christmas village without any notice to security agencies. “There was no robbery incident in Calabar and nobody was attacked by robbers in any other part of Cross River State. What happened was that the government had initially planned to host the musician at the stadium, but the plan was changed to the Calabar Christmas Village. They probably had misunderstanding with the organisers. It was the change of venue that was not properly organised,” he said.